The Ace of Cups shows the way deep into our soul, to detect beauty and trust. It stands for the sources of love, for growing feelings, the desire for a relationship or the readiness to have a friend. 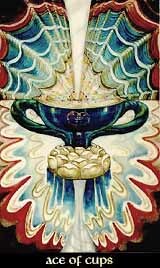 Referring to the Kaballah, the Ace of Cups is attached to Briah - the world of pure feeling and sensitive intention.It is the female counterpart of the Ace of Wands, representing the female element water as a sign for devotion and care. The card also tells that the beauty and the ugly are two poles belonging together. Without shadow, there's no light - and mud is needed to make liliths blossom.